Flooding and water damage events at your Deep Creek and Port Charlotte Florida commercial properties are often complex with numerous issues that require a knowledgeable and flexible response. Whether we’re dealing with a relatively small water cleanup scenario or a large scale event, we work quickly to assess each unique situation and isolate the damaged area. In many instances, normal operations can continue in a temporary space while we restore your facility. SERVPRO of Port Charlotte specializes in the cleanup and restoration of commercial and residential property after a water damage event. Our staff is highly trained in property damage restoration. From initial and ongoing training at SERVPRO’s corporate training facility to regular IICRC-industry certification, rest assured our staff is equipped with the knowledge to restore your property. SERVPRO of Port Charlotte is an IICRC firm. The Institute of Inspection, Cleaning and Restoration Certification (IICRC) creates the standards for the restoration industry and provides training and certification to restoration companies. IICRC Certified Firms have the right to display the IICRC Certified Logo. 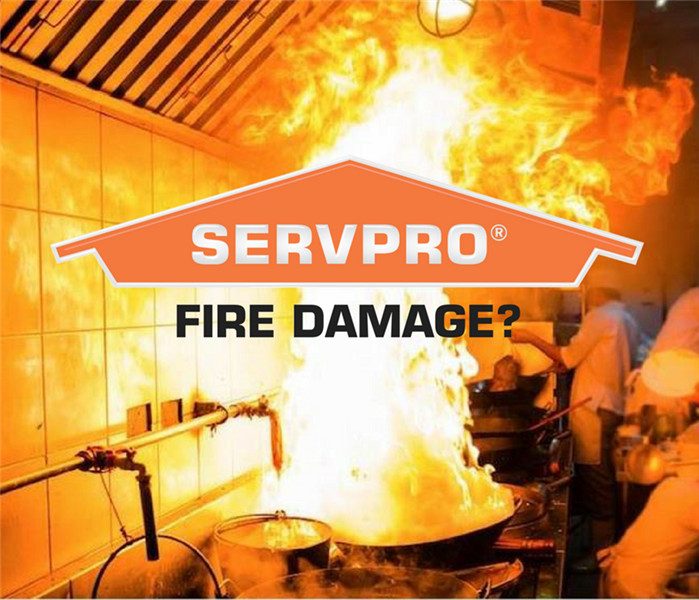 SERVPRO of Port Charlotte specializes in the cleanup and restoration of residential and commercial property after a fire, smoke or water damage event. Our staff is highly trained in property damage restoration and we are an IICRC Certified Firm. 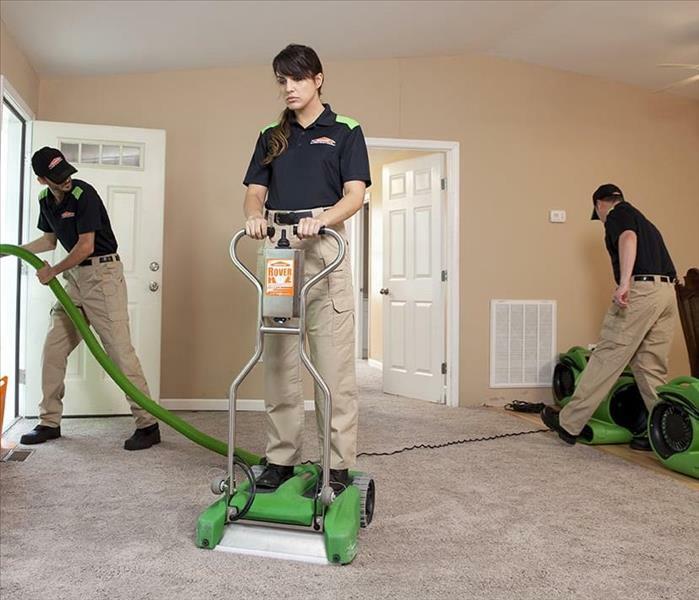 We believe in continuous training: from initial and ongoing training at SERVPRO’s corporate training facility to regular IICRC-industry certification, rest assured our staff is equipped with the knowledge to restore your property. 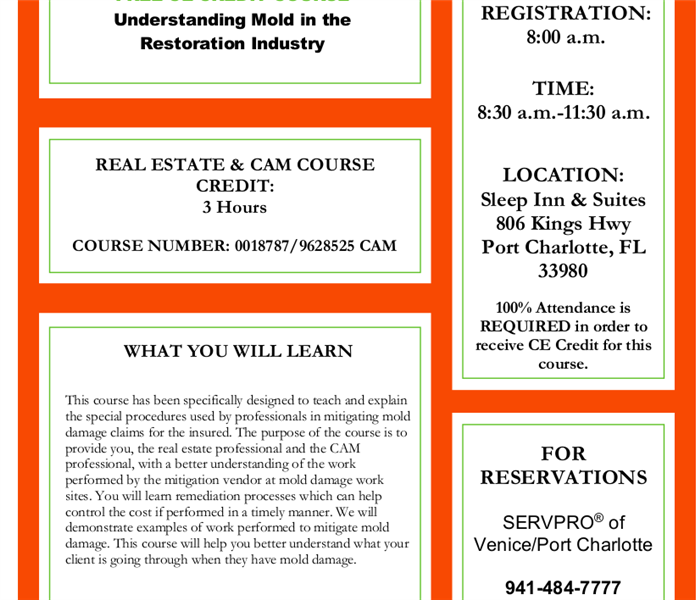 What you will learn: This course has been specifically designed to teach and explain the special procedures used by professionals in mitigating mold damage claims for the insured. The purpose of the course is to provide you, the real estate professional and the CAM professional, with a better understanding of the work performed by the mitigation vendor at mold damage work sites. You will learn remediation processes which can help control the cost if performed in a timely manner. We will demonstrate examples of work performed to mitigate mold damage. This course will help you better understand what your client is going through when they have mold damage. COURSE TIME: 8:30 a.m.-11:30 p.m.
Be prepared for this upcoming Hurricane Season! Join us for the 2018 Hurricane Preparedness Expo This Saturday, May 19th from 10:00 AM - 3:00 PM event held at the Charlotte Harbor Event and Conference Center 75 Taylor St, Punta Gorda, Florida 33950 Hurricane Preparedness Seminars at 10:30 am and 1:30 pm. Featuring: Wink News Meteorologists, Gerald Mallet of Charlotte County Emergency Management, and the American Red Cross. Over 40 local businesses will be participating with booths and possible door prizes drawn throughout the day for this popular event occurring just before the start of Hurricane Season. If you are new to Charlotte County and want to know what to do to prepare for hurricane season, this is the event for you. The Charlotte County Emergency Management Team will be on hand to answer any questions you may have. Seminars in the morning and afternoon. Free Admission Throughout this event, please stop by our booth, where we will be there to answer any of your questions. Ask us about how we can create a no-cost Emergency Ready Profile (ERP) for your business, office, and your home. 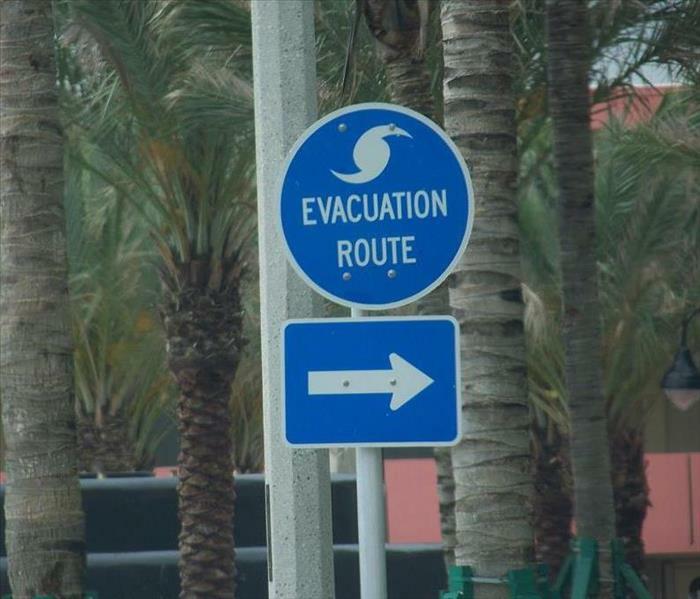 This "ERP" give you an initial plan of action to take during a man-made or natural disaster. We look forward to seeing you! Seconds count and can mean the difference between residents of our community escaping safely from a fire or having their lives end in tragedy. 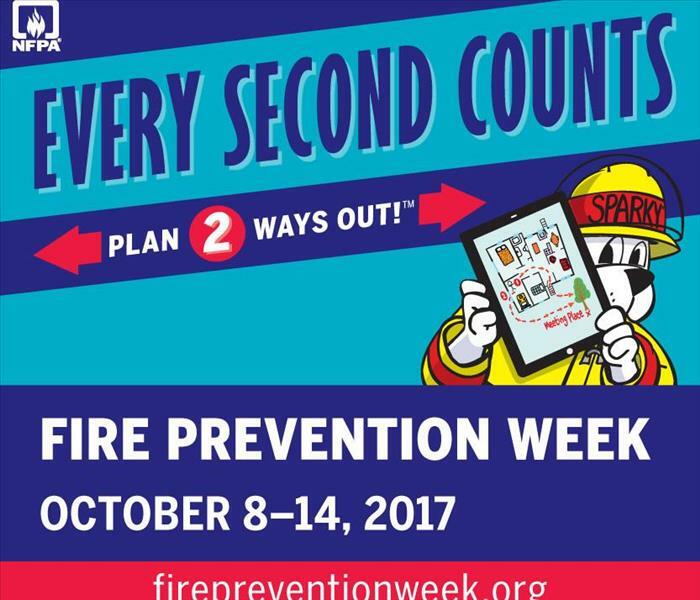 October is Fire Prevention Month and an excellent time to examine the emergency preparedness plans for your home and business, including your fire escape plan. Do you have a fire escape plan? Have you changed your smoke alarm batteries within the last year? Are you prepared? According to the NFPA, once the fire alarm goes off “you could have less than two minutes to get out safely,” yet only 8 percent of people surveyed said getting out was the first thought after hearing a fire alarm. Creating, implementing, and practicing a fire escape plan for your home or business may be the difference between safety and tragedy. Make a plan today. SERVPRO® of Port Charlotte wants you to stay safe, informed, and prepared to help ensure you are ready for any disaster that comes your way. Port Charlotte Residents: We provide immediate service day or night! 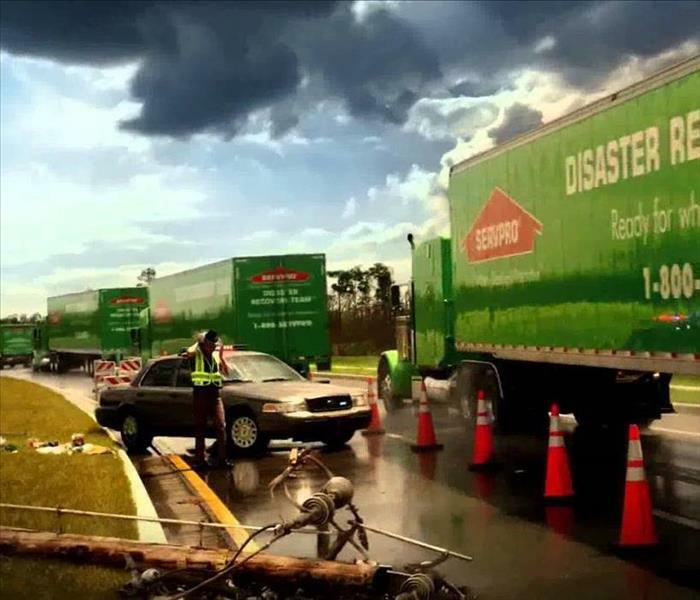 SERVPRO of Port Charlotte provides 24-hour emergency service and is dedicated to being faster to any-sized disaster in the Port Charlotte area. We can respond immediately to your emergency and have the expertise to handle your restoration or cleaning needs. 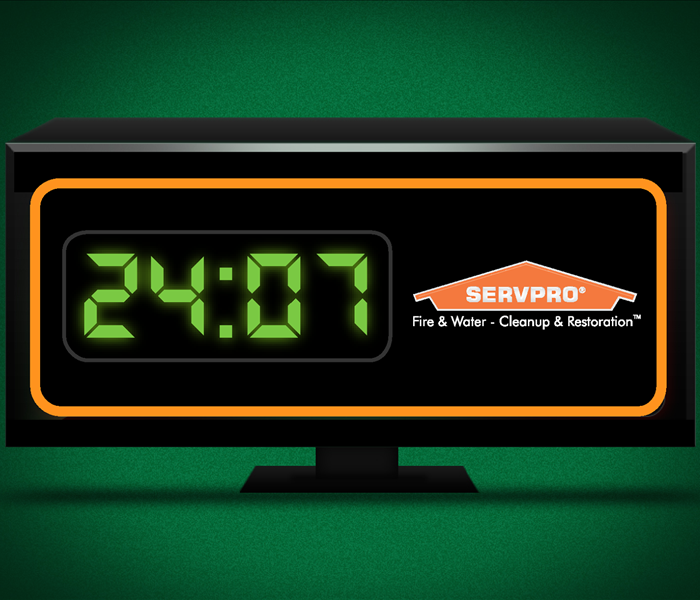 When Storms or Floods hit Port Charlotte, SERVPRO is ready! SERVPRO of Port Charlotte specializes in storm and flood damage restoration. Our crews are highly trained and we use specialized equipment to restore your property to its pre-storm condition. When storms hit Port Charlotte, we can scale our resources to handle a large storm or flooding disaster. We can access equipment and personnel from a network of 1,650 Franchises across the country and elite Disaster Recovery Teams that are strategically located throughout the United States. Smoke and Soot Damage Can Cause a Pervasive Odor in Your Port Charlotte Home. Does Your Port Charlotte Home Have A Mold Problem? 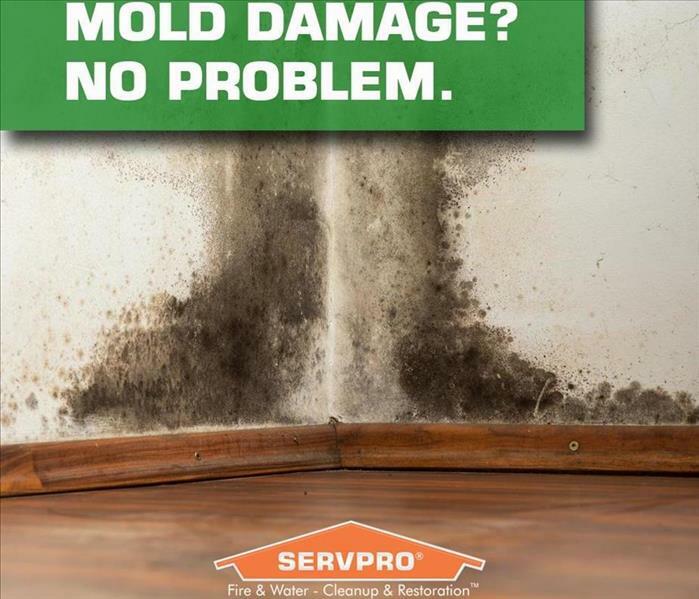 In Southwest Florida, mold can spread through a home in as little as 48 hours. SERVPRO of Port Charlotte is ready to help anytime you need us for a kitchen, bathroom, home, or business water damage or flood. SERVPRO of Port Charlotte is available 24 hours a day for water emergencies, large or small. When you are dealing with water damage, immediate action is crucial. A delay of just a few hours can greatly increase the severity of the water damage. We understand that when you call us, you may be feeling confused, stressed, and vulnerable. You need an expert to guide you through this crisis. SERVPRO of Port Charlotte has the specific water damage training and experience to help you through this tough time. We specialize in water damage restoration—in fact, it's the cornerstone of our business. 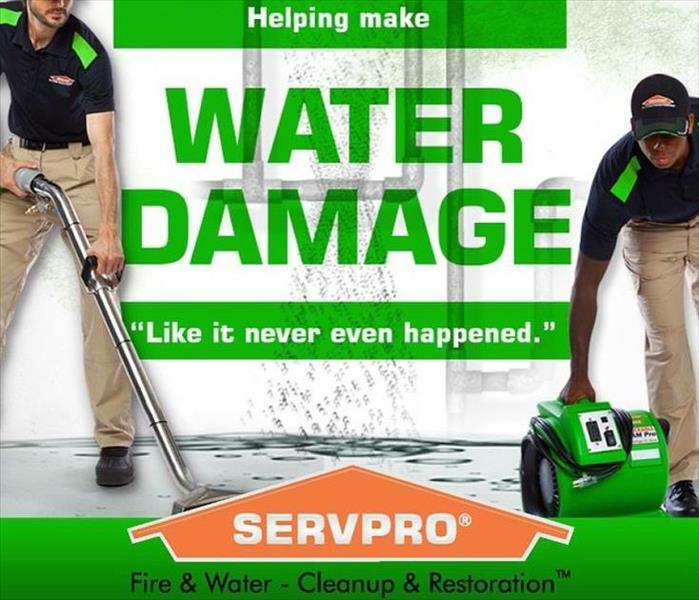 SERVPRO of Port Charlotte specializes in the cleanup and restoration of residential and commercial property after a fire, smoke or water damage event. Our staff is highly trained in property damage restoration. From initial and ongoing training at SERVPRO’s corporate training facility to regular IICRC-industry certification, rest assured our staff is equipped with the knowledge to restore your property. 9/19/2017 - When Storms or Floods hit Port Charlotte, SERVPRO is ready! 10/25/2016 - Does Your Port Charlotte Home Have A Mold Problem?